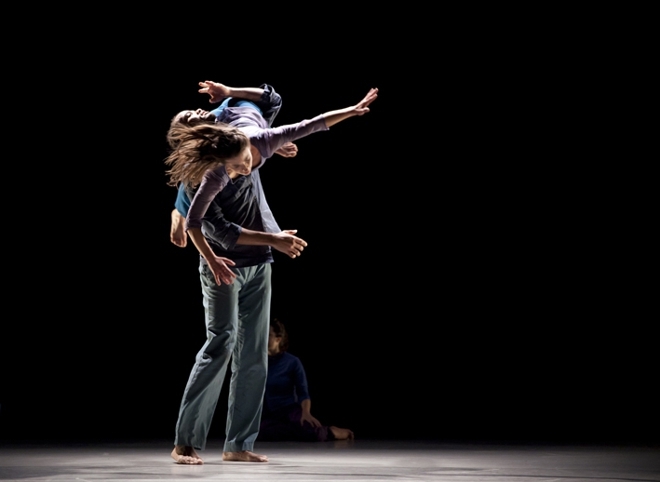 Israeli born choreographer, Hagit Yakira, brings …in the middle of you back to London as part of the company’s 2015 tour, in a sold out performance at Richmix. The piece started its journey in 2013 and delivers a poignant message of persevering through troubling times in a fun and uplifting expression of life through dance. Yakira’s quintet is on the cusp of soaring with success after finding their way out of muddling slumps, emerging out of a hot mess. The five, charming dancers interact in pathways that wriggle through the space. …in the middle of you is plain and simple, with no added extras. It is a dance with no fancy frills of extravagant lights, set and costume. The production is easily transferable, only needing a clean space, displaying how a great piece can be produced with the dancers’ energy being enough to make for an enjoyable hour of contemporary dance. Mariana Camelot skims around the floor fluidly, interrupted briefly by Kiraly Saint-Claire who jumps in and spins her effortlessly like a Catherine wheel. Calm, bohemian flashes like this picked up the often monotonous rhythms that the dancers succumb to. These instances are complimented by David Leahy’s folk sounds that ends this intimate piece on a high. Exploding into contagiously raucous laughter the dancers pace, before this wanes into yet more floor work. …in the middle of you becomes slightly predictive and repetitive, in unison phrases that build from one to five dancers. This contrasts with the lively and uncertain games where the dancers catch and lift each other. Having attended a few of Yakira’s classes it is exciting to see her vocabulary on stage. Experiencing her direction and motivation to push your body to knackering extremes, I was able to understand how the dancers kept moving with increasing speed. The three male dancers play a game of Twister with clothes, manipulated by Sophie Arstall’s story of continuously running, whilst Camelot teases the men by moving the clothes to divert their next steps. 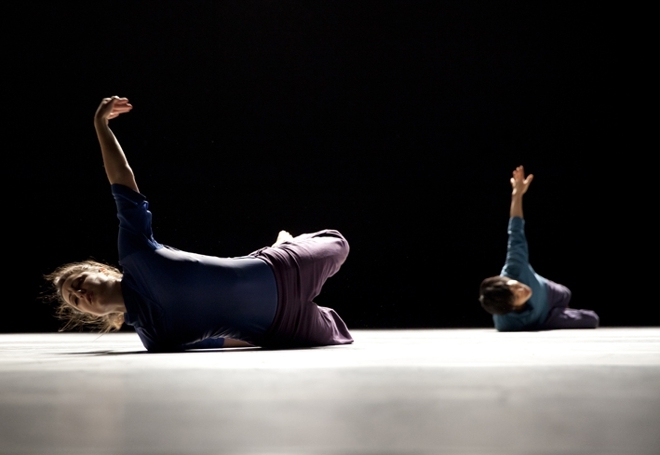 Yakira has clearly developed an experiential approach to movement that uses improvisation techniques to stimulate raw responses from her dancers. As part of Yakira’s tour she is inviting you to contribute to the piece, enriching it by offering your own stories, photos, images, songs and thoughts on what ‘being in the middle’ means to you. The collection of stories will help the company develop the piece and will follow the tour as a foyer installation. Allowing her work to stay in an evolving cycle of change is a fantastic example of a choreographer constantly trying to challenge their choreography. Yakira provides an uplifting piece, with openness that encourages an engagement from audience members and keeps you involved in her choreographic process.